I love daylight savings time as I get an extra hour of sleep. It was Sunday morning and the alarm clock went off at 7 AM. I did not get up and slept a little more. You would think with the extra hour of sleep I got from it being daylight savings that I would have been quick to get up, but know I stayed in bed until I realized that I had 30 minutes before I had to leave for church. I got out of bed and realized I had not ironed my skirt for church and I had no time to iron. I quickly realized that I had a bottle of Downy Wrinkle Releaser Plus downstairs on my dinning room table. I was sent a bottle to review and now was the best time to put it to use. 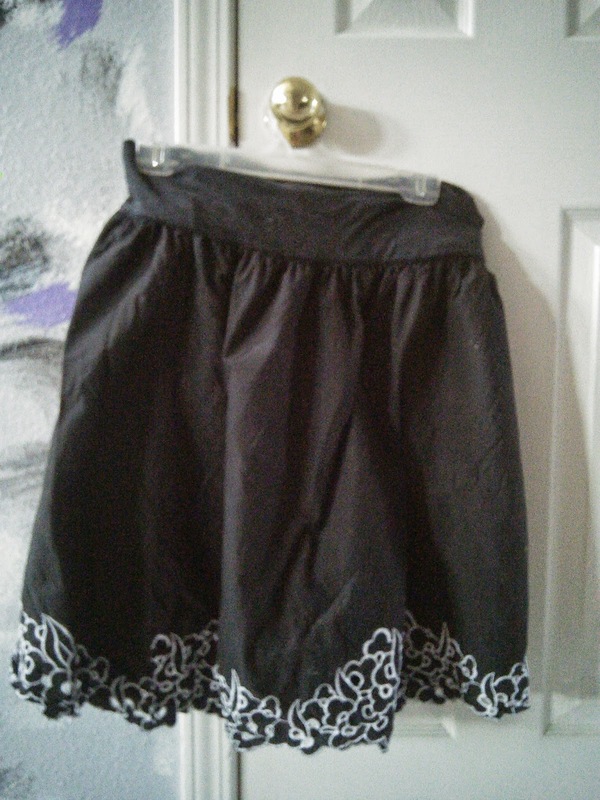 I brought my wrinkled skirt downstairs to apply the Downy Wrinkle Releaser Plus to. The spray was easy to use. 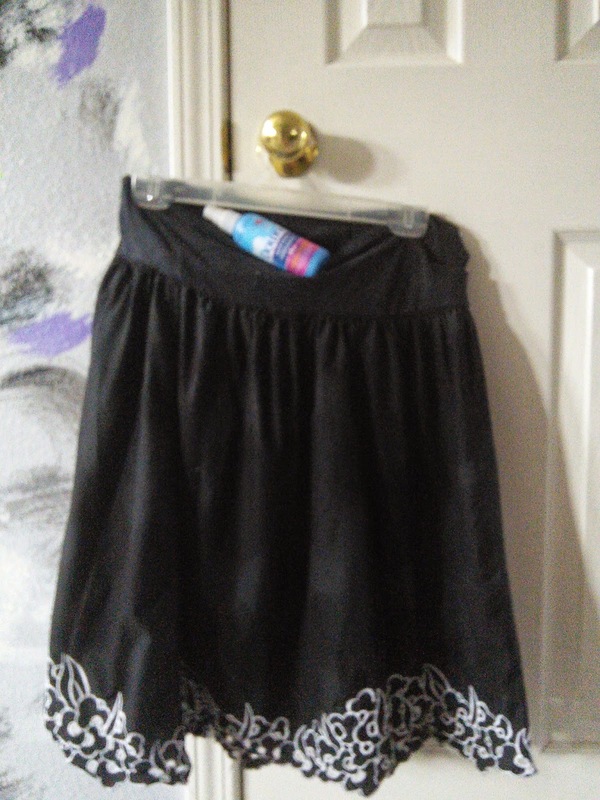 I sprayed my skirt with the great smelling spray and then I gave it a couple of tugs. My skirt had no wrinkles and it smell great too. This process took less time than getting out my iron and ironing board. Thanks Downy for helping me get ready for church quickly! I love that I was able to get the wrinkles out of my skirt quickly. Downy Wrinkle Releaser Plus is a great product for getting wrinkles out of fabric when you are not near an iron or simply have no time. This wonderful spray allows you to spray, smooth, and tug to give your clothes a fresh smelling wrinkle free look. 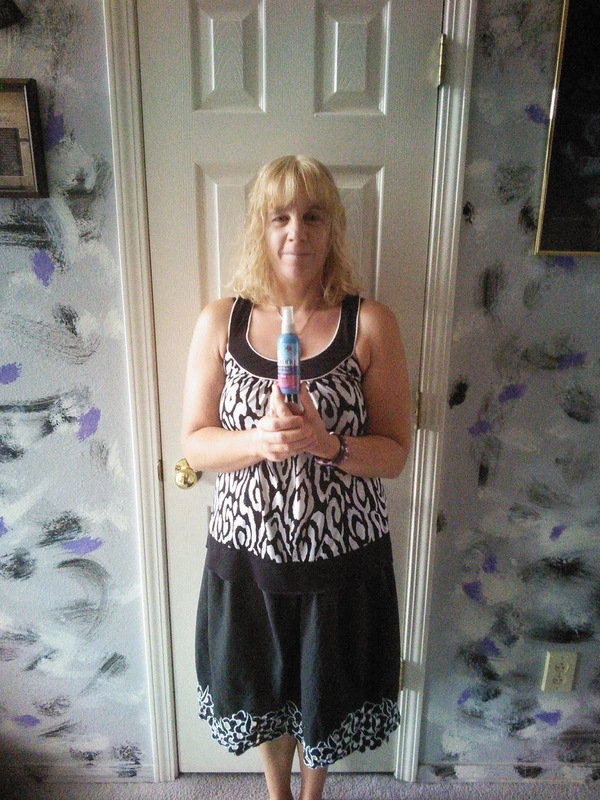 The spray comes in several sizes and includes a purse size one too that is great for getting wrinkles out on the go. 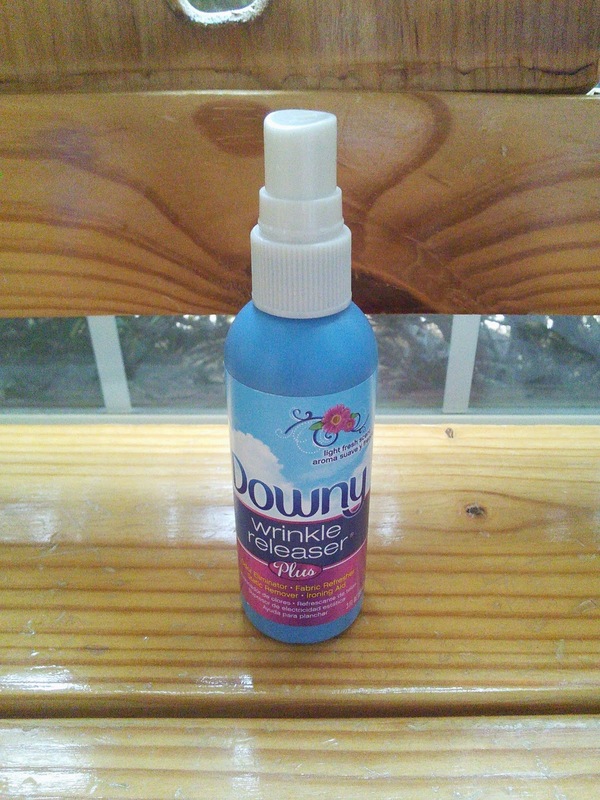 This Downy spray goes beyond wrinkles on your clothes. You can use it to freshen up furniture or get wrinkles out of curtains while they are hanging up. Too see the many uses of Downy Wrinkle Releaser Plus, just click on the below links. 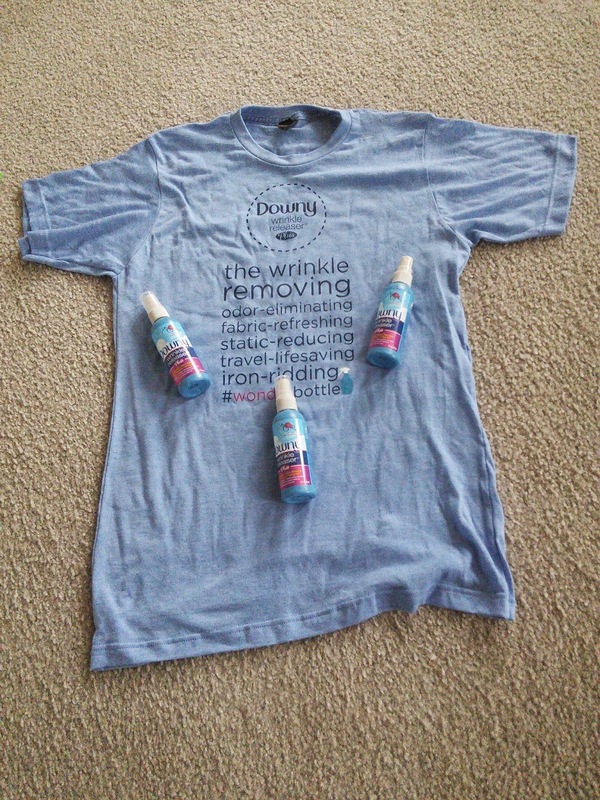 I have three travel-friendly bottles of Downy Wrinkle Releaser Plus along with a t-shirt to giveaway to one of my readers. Just enter on the Rafflecopter form below and good luck. I think my shirt needs some Downy Wrinkle Releaser Plus ! "These opinions are my own and I received the above mentioned product to do my review and to host this giveaway." It will help me a lot, since I rarely pull out the ironing board :) I remember lots of ironing as a child. Great product -- thank you! I really hate ironing. It has to be one of my least favorite things to do. I usually take mine with me when we travel and am able to use it for quick fixes. I love it - works great and easy to store. We don't like to spend time ironing, so using a wrinkle releaser is necessary for some pieces of clothing. We use it all the time! It's quick and easy to use. this would be great for when I travel to concerts and events. Travel size anything is awesome. Time. I have zero time or patience for ironing anything. lol I would end up wearing whatever it was completely wrinkled and I'd definitely rather not. This sounds like a great solution! I tried the original with good results and had no idea there was a 'Plus' product on the market. I don't like ironing, so this would be great for some of my shirts that get wrinkly. I have a little problem with remembering to pull my laundry out of the dryer in a timely manner sometimes so this would definitely help. I love using a wrinkle releaser, I keep forgetting to buy some more. We ran out a few weeks ago. I'm sure my husband could use this when he travels. I absolutely hate ironing - especially when I travel. This would be such a time saver! It would also be great for my husband who flat out refuses to iron. Hate ironing. This would be perfect! I don't have an iron. lol So this would help a lot! It will help me because I hate ironing and love the smell of downy! Downy Wrinkle will help with my shirts I get tired of ironing them. Mom of three boys(need I say more??) I have no time to iron. This will help me when I travel and reduce the need to iron. This would be great for my work clothes!